There are many qualities that separate SERVPRO of Edgewater/Deale-Churchton/Lothian from the competition. But, one major difference is we help your business put together a disaster plan called an Emergency Ready Profile (ERP). 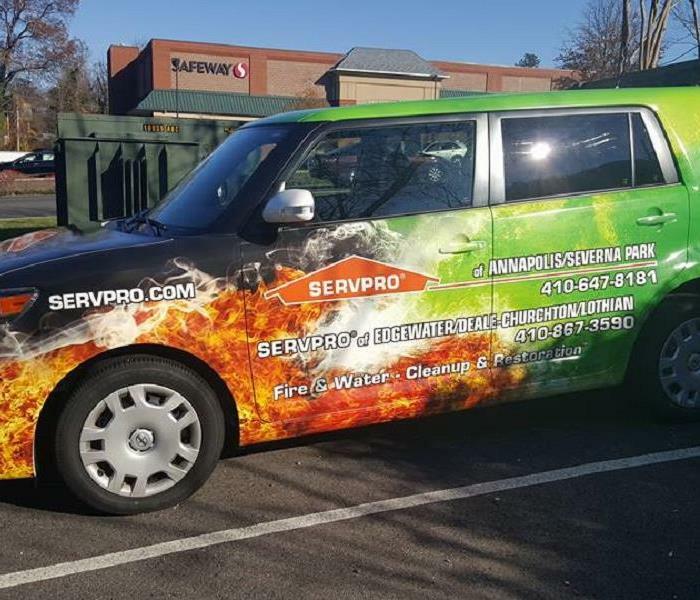 When your property suffers from a disaster, SERVPRO of Edgewater/Deale-Churchton/Lothian is here to help. 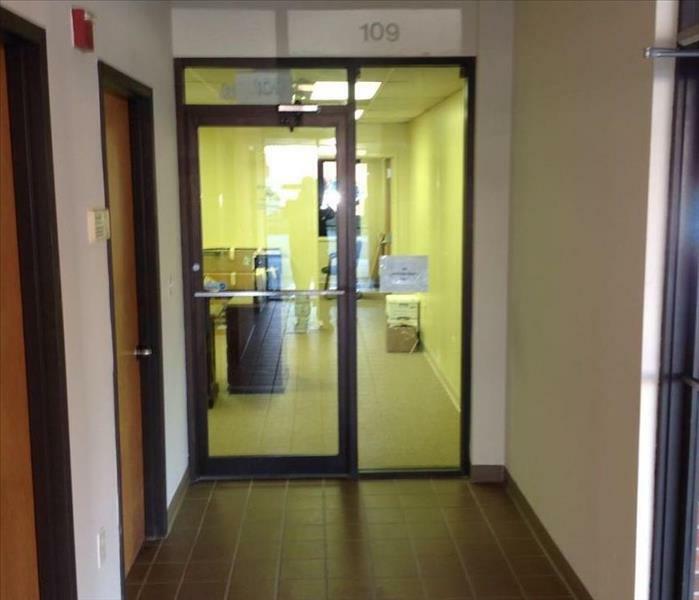 Did you know we have an 18,000 square feet facility in Arnold Maryland? 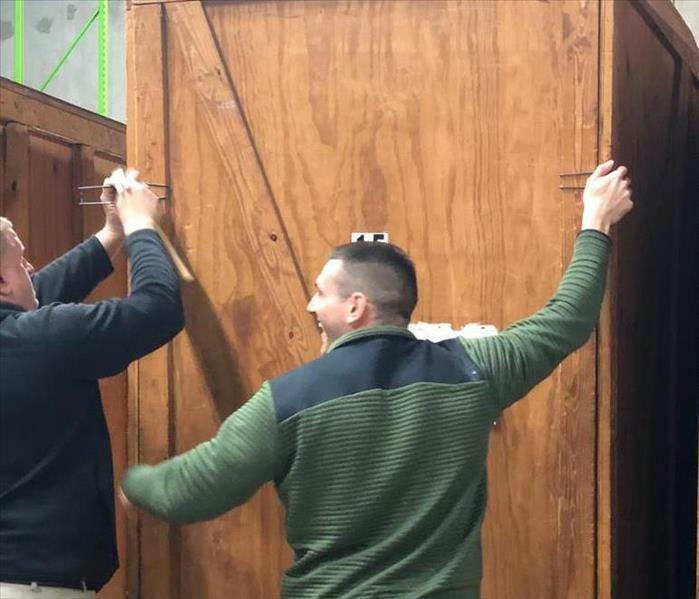 This facility is often used to store contents of your home or business while SERVPRO of Edgewater/Deale-Churchton/Lothian provides restoration services. 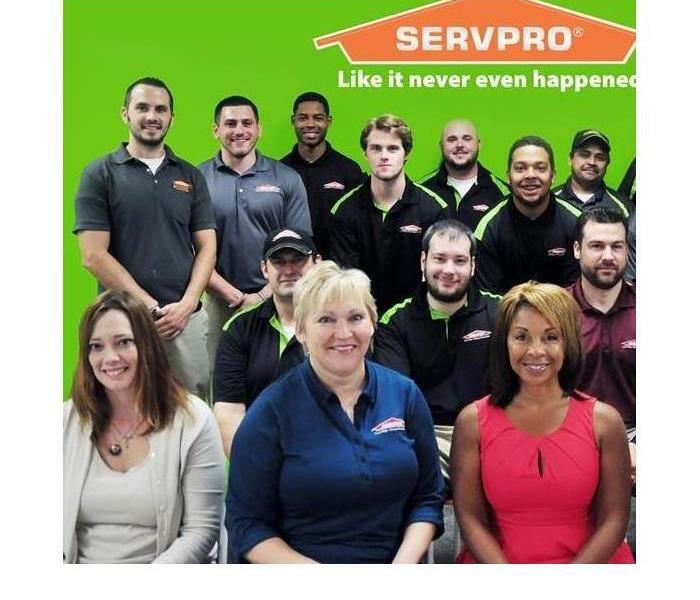 Why does SERVPRO of Edgewater/Deale-Churchton/Lothian have such a great reputation? Because our team works well together. 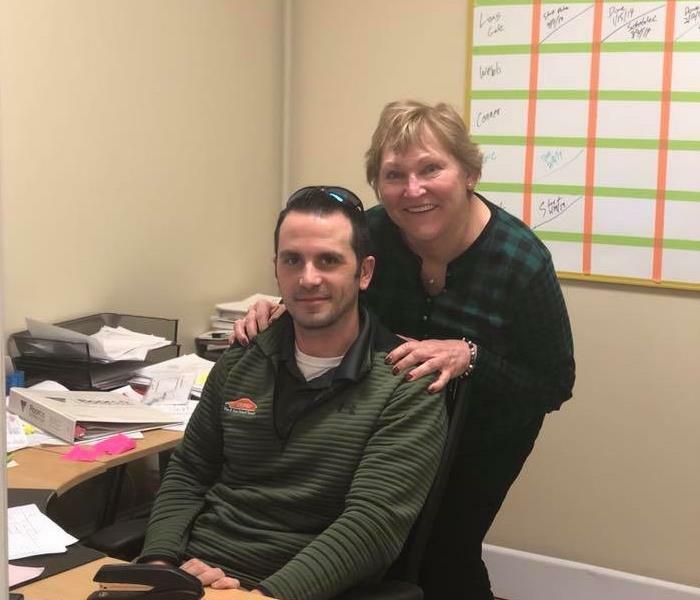 Effective communication is something that our franchise owner, Diane, and our general manager, Chris, continually encourage. 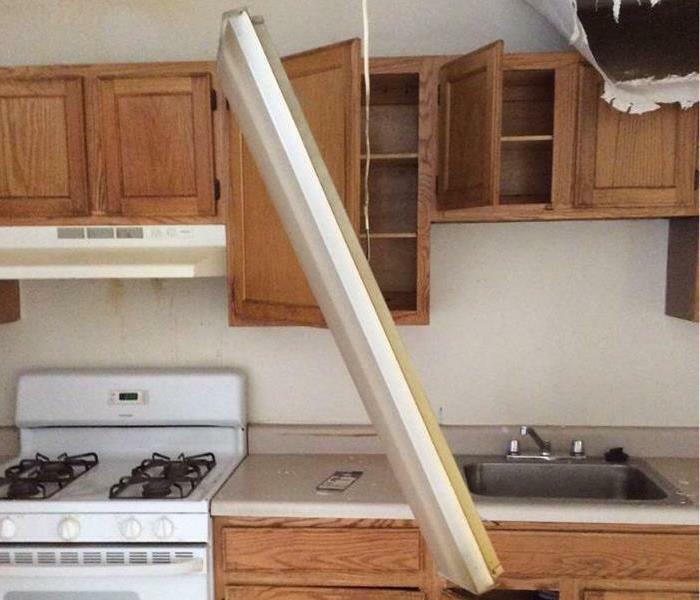 Washing machine water leak caused major damage to this townhouse. The homeowner contacted SERVPRO of Edgewater/Deale-Churchton/Lothian because we are known in the community as water damage specialists. 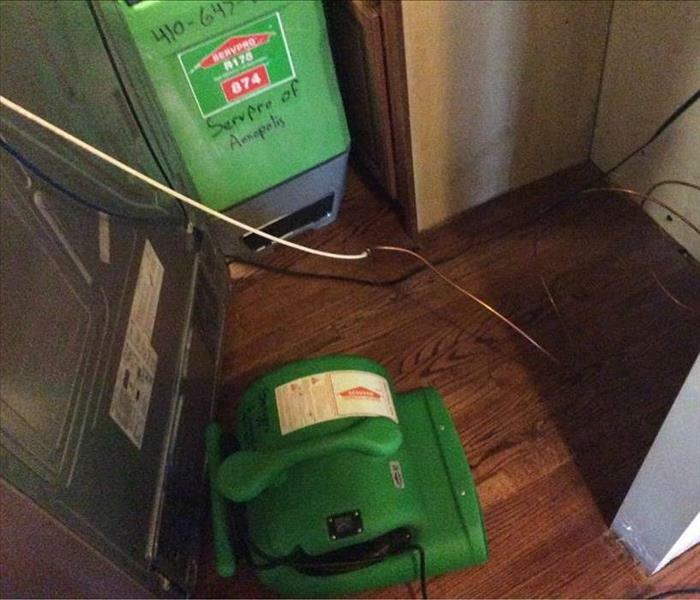 SERVPRO of Edgewater/Deale-Churchton/Lothian worked with an Edgewater homeowner who had water in their basement. They were referred to us by their builder, who said we would come out immediately to address the water damage. 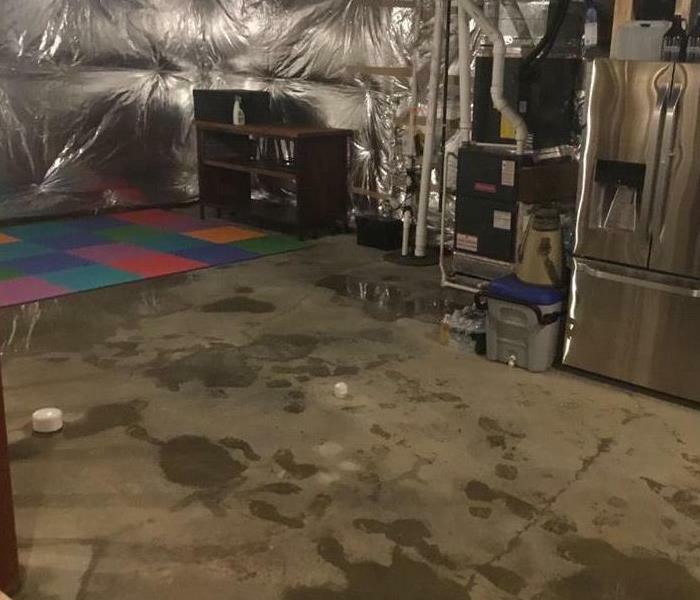 As water damage specialists, our team has the experience, expertise, and training that enabled them to get this basement dried quickly and thoroughly. March 20, SERVPRO of Edgewater/Deale-Churchton/Lothian hosted an Insurance Agent continuing education class at the DoubleTree Hotel in Annapolis. The class was attending by 20 local agents and insurance adjusters. Our next class will be held in June. 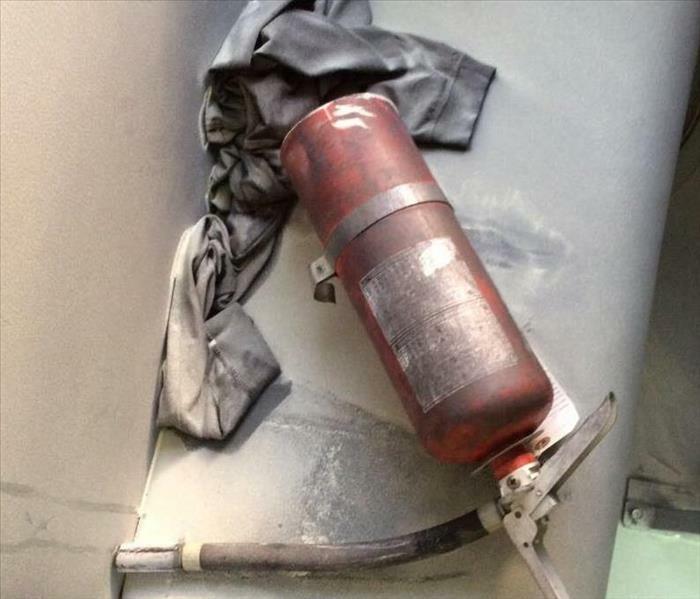 What happens when a fire extinguisher goes off? What happens when a fire extinguisher goes off? It leaves a mess. Fire extinguishers contain different chemicals, depending on the application. The active material may be a powder such as potassium bicarbonate (KHCO3), liquid water, an evaporating fluorocarbon or the propelling agent itself. Recently, SERVPRO of Edgewater/Deale-Churchton/Lothian cleaned a bus which incurred a mess when a fire extinguisher went off inside. Our crew performed a general cleaning as well as monitored the area for moisture. When the unexpected happens, call the cleanup team that is faster to any size disaster. Meet the team in our Arnold Maryland main office. They provide outstanding support. 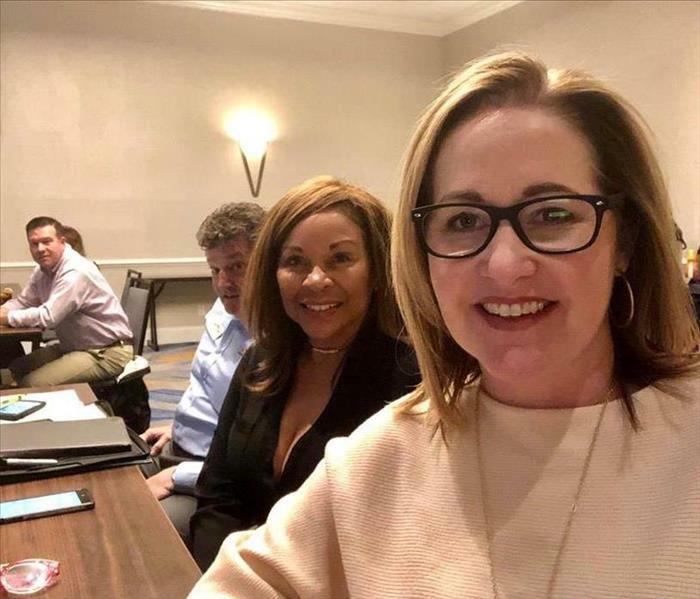 Represented in this photo are Sales and Marketing, Account Support, Rebuild Management and more. 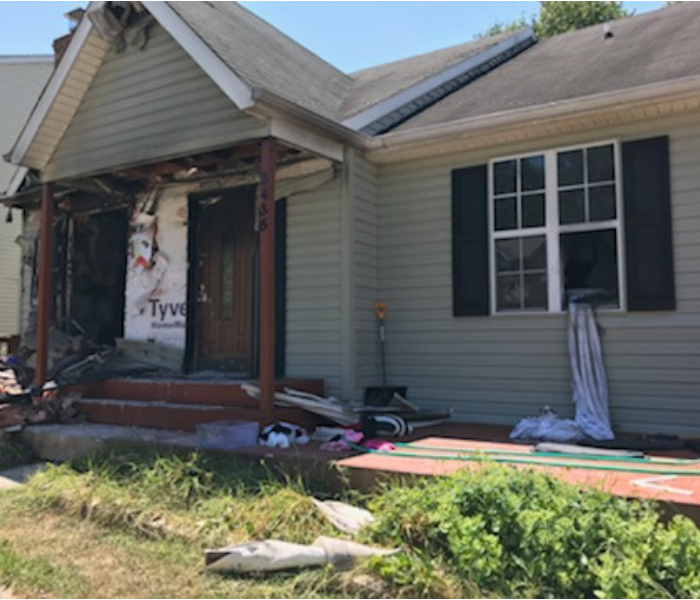 SERVPRO of Edgewater/Deale-Churchton/Lothian helped residence of this Pasadena home when it suffered an electrical fire. The fire occurred early in the morning. Thankfully, all members of the family evacuated safely. Our team wants to remind everyone that it's important to have working smoke alarms. This is what helped save this family. Please take the time to test your smoke alarms on a regular basis. Click here to get more information on how to properly test your alarm from Anne Arundel County Fire Department. 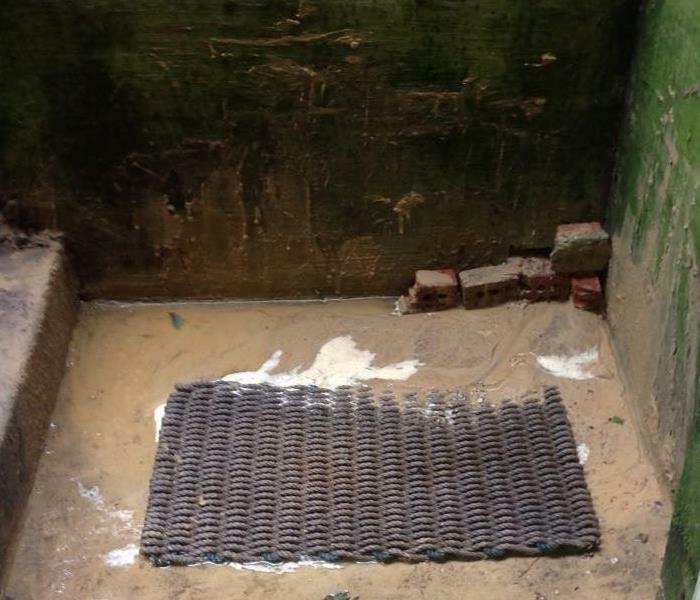 When heavy rain saturates the ground, it can cause water to flow into basement stairwells. 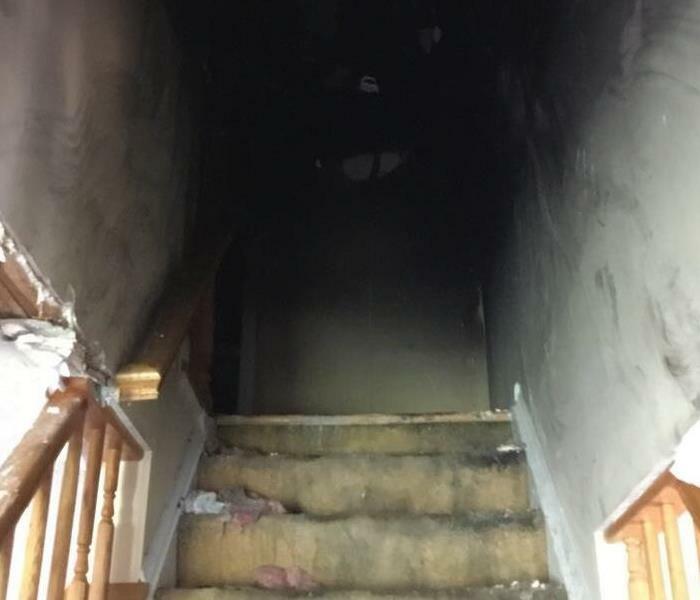 In this Pasadena, Maryland home, SERVPRO of Edgewater/Deale-Churchton/Lothian was called to help with damage from the storm water coming into the basement from the flooded stairwell. 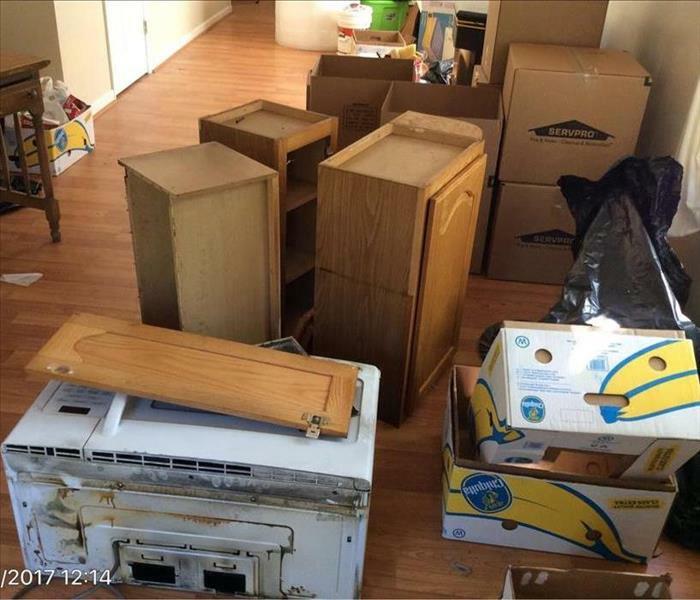 The damage included carpet, fuse ball table, and a futon. 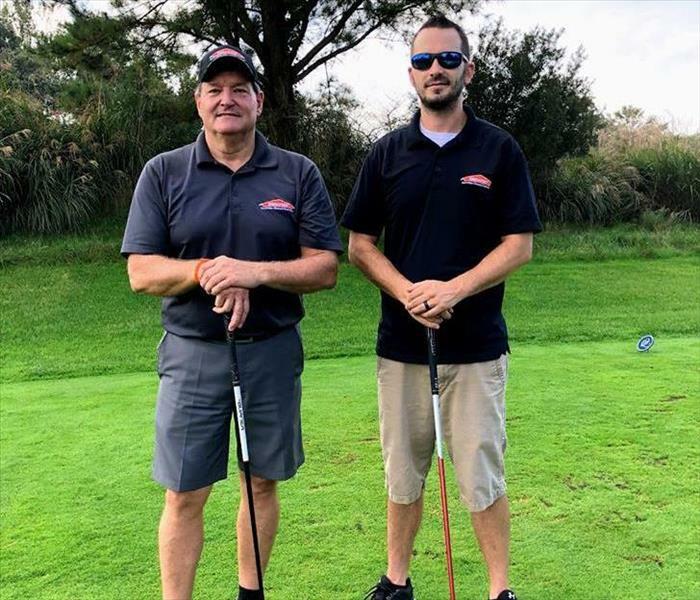 Chris and Phil of SERVPRO Edgewater/Deale-Churchton/Lothian participated in the Driving Force for Business Golf Tournament that was held at the award-winning Queenstown Harbor River Course on Tuesday, October 9. 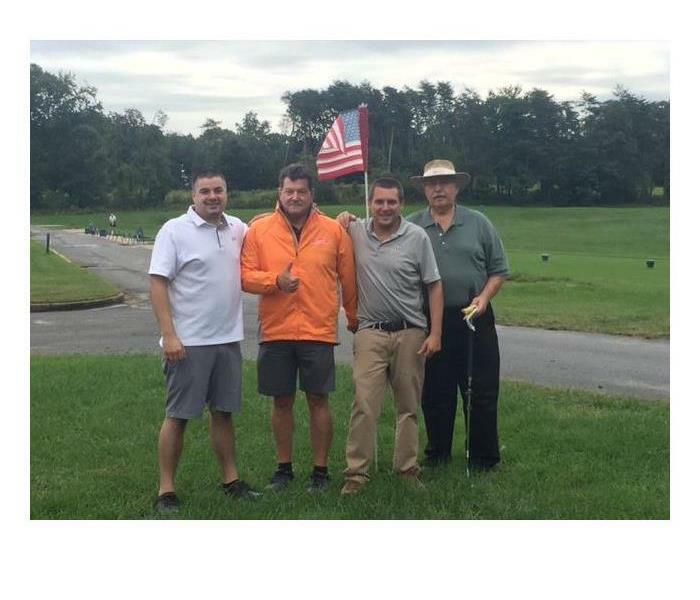 Phil with SERVPRO Edgewater/Deale-Churchton/Lothian at the Pasadena Business Association Golf Outing on September 27, 2018 at Compass Pointe Golf Course. This Davidsonville homeowner called us because her sump pump failed during a storm on July 30, 2018. Our SERVPRO Edgewater/Deale-Churchton/Lothian crew was dispatched to evaluate the damage. When families go on vacation, they turn off their air conditioner. 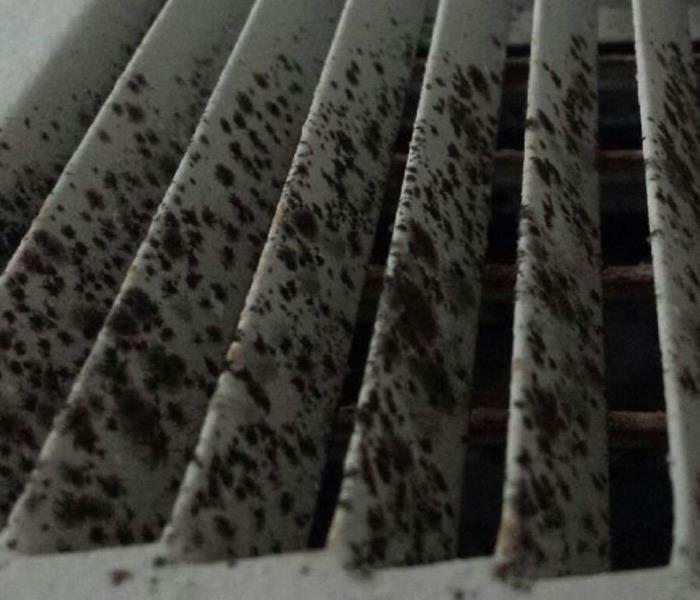 When this happened in a Pasadena, Maryland home, mold appeared on the vents. The family was away for a week and when they returned, they noticed mold on 2 vents in the house. SERVPRO Edgewater/Deale-Churchton/Lothian was called to provide an estimate because the estimate the received from another company was too high in price. 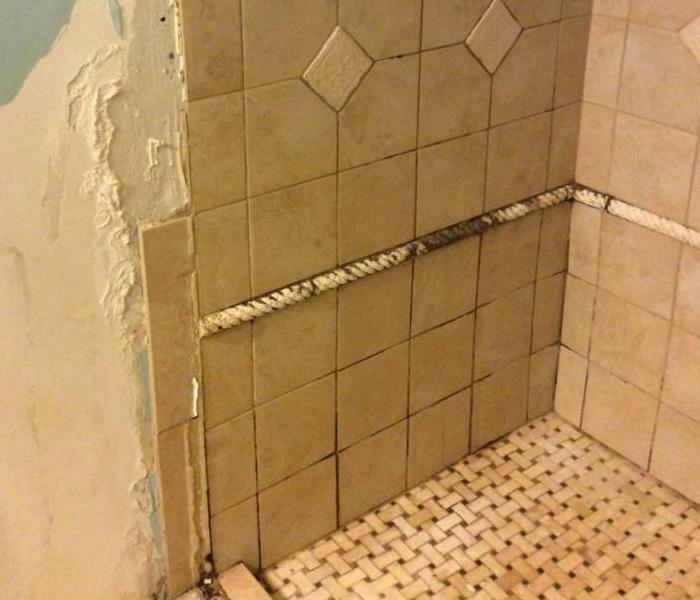 The homeowners were pleased with our price and the work. Our suggestion is to leave the air conditioner on while you are away, just increase the temperature a bit. 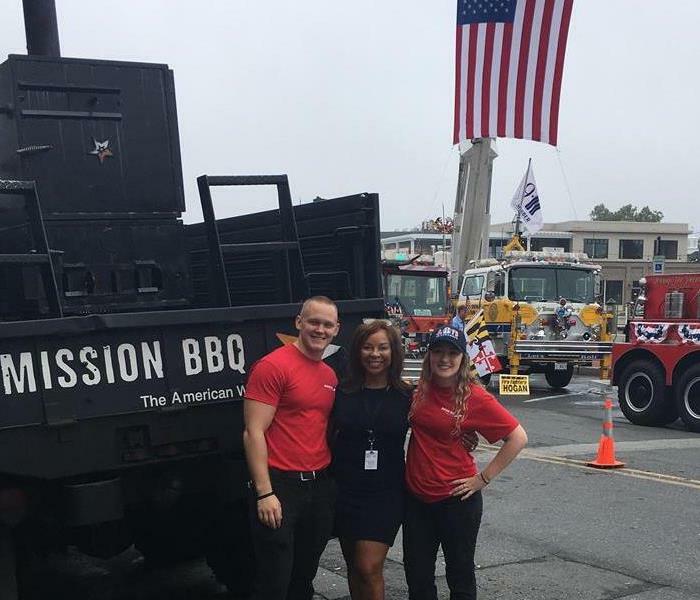 Trish of SERVPRO Edgewater/Deale-Churchton/Lothian attended a 9/11 memorial at Mission BBQ in Annapolis. This photo shows the devastation of a home fire in Pasadena, Maryland. Our team provided this family with outstanding support during this devastating time. When the power goes out so do most sump pumps. Many pumps are now installed with a battery backup that will keep the pump working during a power outage. 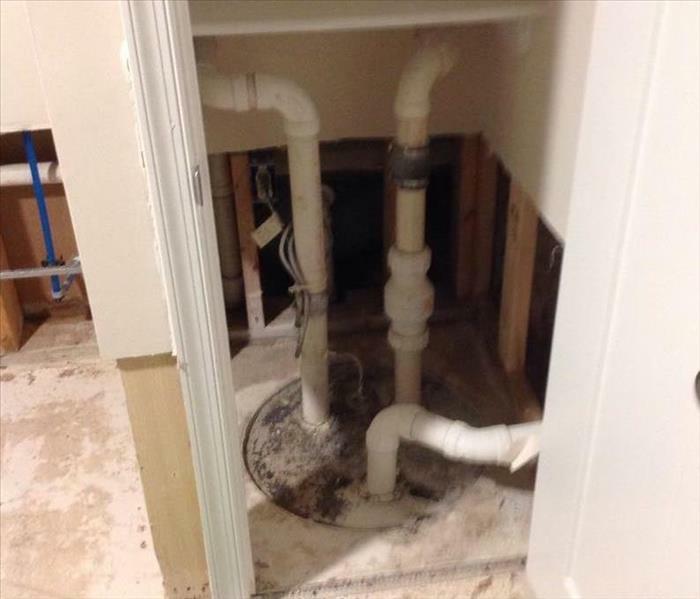 This home did not have a back up and the pump failed to expel water that entered the basement during a large rain storm. Anywhere there is water in a home can be a source for water damage that leads to mold. Toilets can have small slow leaks that seep under the flooring. 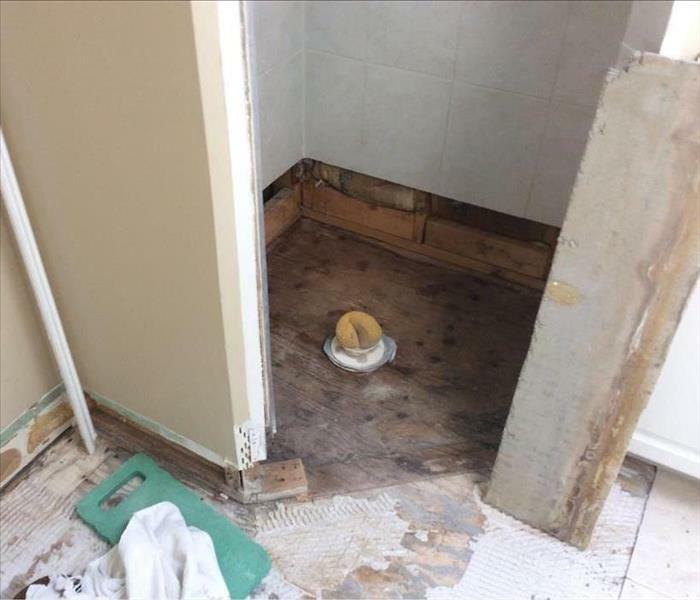 The dampness and high humidity lead to mold growth under the bathroom flooring. 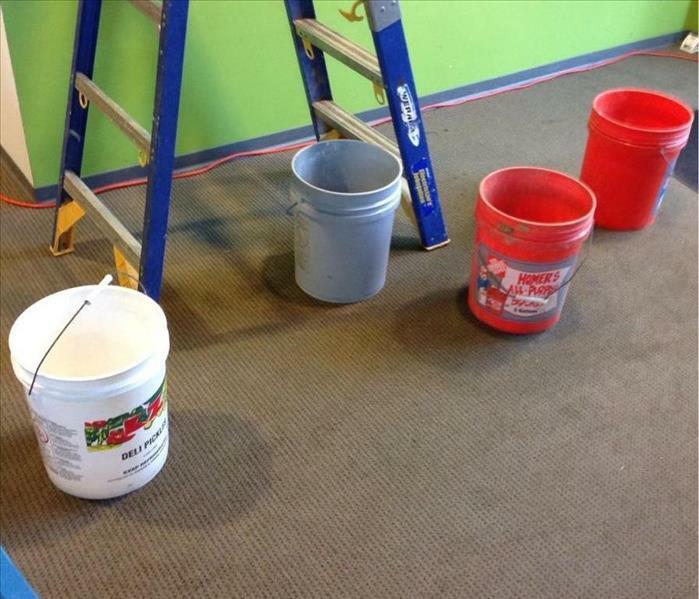 Keeping job sites dry and mold free is just one more item project managers worry about. 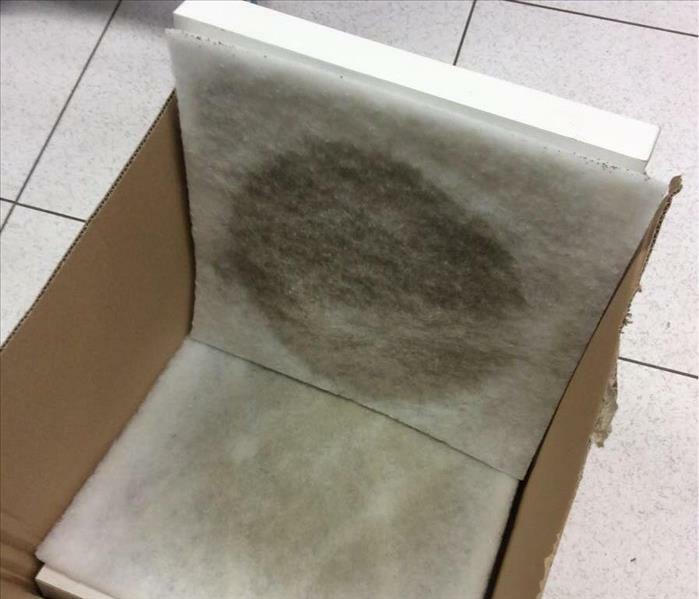 Sometimes it is the materials that show up wet from transport or they are damaged onsite. It is important to make sure everything is dry before 'closing in". 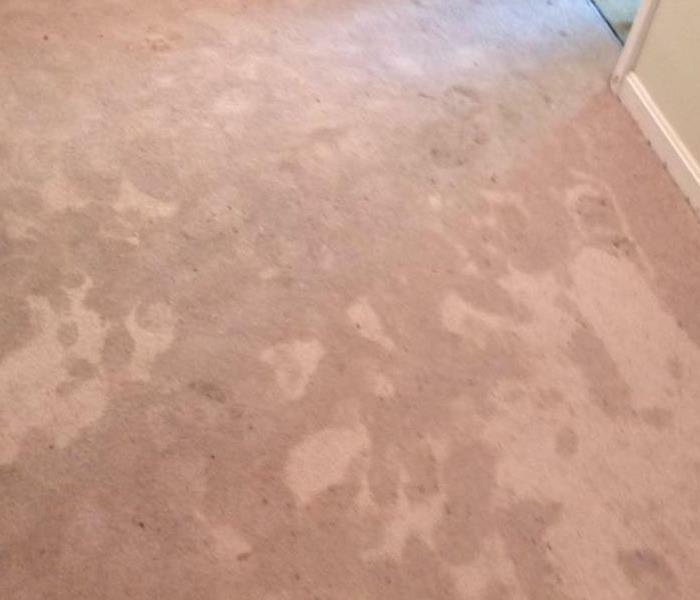 People do not often think about the items in a home that is effected by water damage. 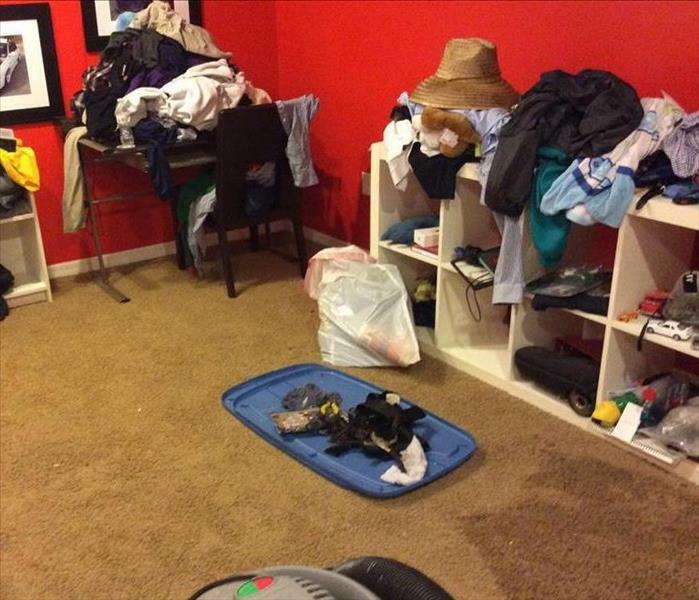 If the water leaks from the ceiling like in this home, all the clothes in the closet as well as items on the cabinets were wet. 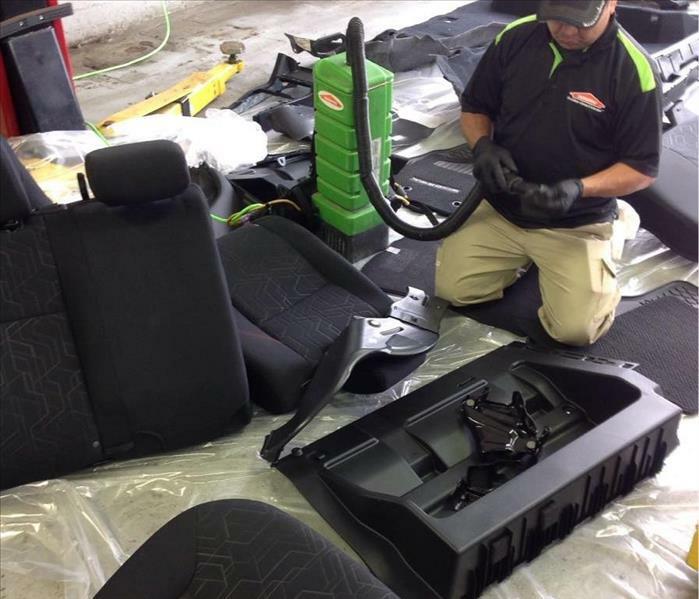 SERVPRO has special dry cleaners and content cleaning rooms to restore most items in a home. Pour 3 to 4 cups of white distilled vinegar into the ice-maker and dispenser lines with a small funnel and allow it to soak for five to 10 minutes to break down the lime. 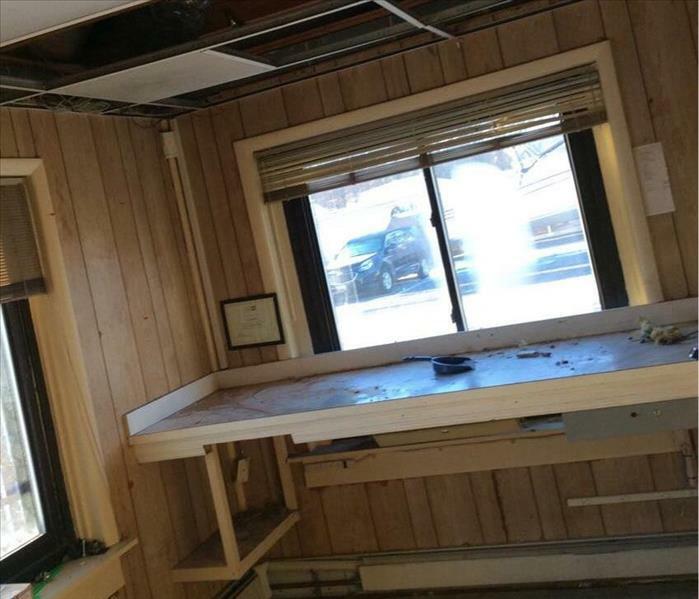 The small marina office building suffered from a water pipe bursting from the ceiling. The water soaked the ceiling tiles and insulation which then landed wet on the desk. Our teams came in and removed the debris and dried out the remaining structure. Storm damage may not always hit at home, but can hit the local business or churches you frequent. 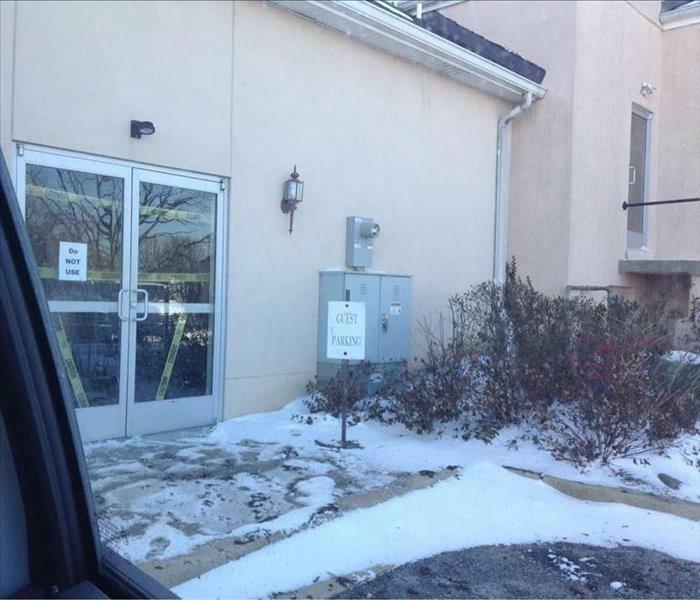 This church had to shut down one entrance while crews worked on the water damage restoration. When the sewer lines back up into a property it is considered a Category 3 water loss. This is the worst classification and is grossly unsanitary. It used to be called black water, and sources include sewer backup, flooding from rivers or streams, toilet overflow with feces, and stagnant liquid that has begun to support bacterial growth. You do not want to clean this up yourself. Let our certified professionals mange this one. When you realize you are in the middle of a water emergency there are a few things to do before help arrives. First thing to do is turn off the water valve if you have access to it. 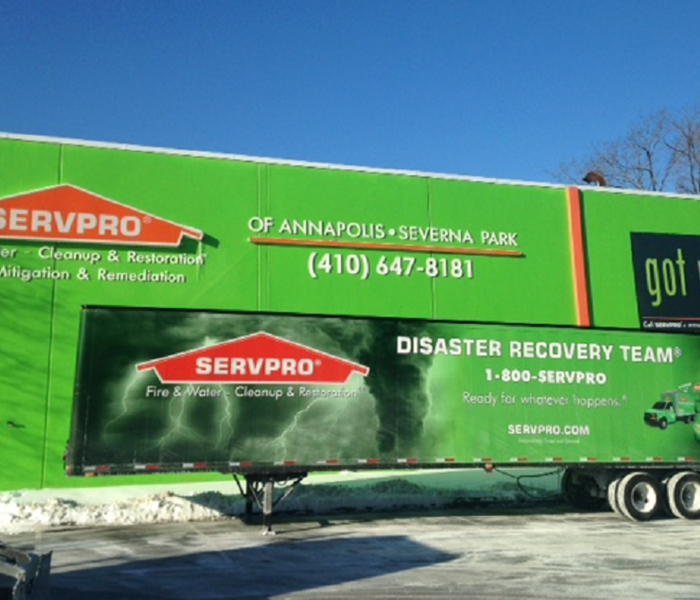 Then call SERVPRO at 410.867.3590 so they can dispatch a water damage service team. Putting out buckets if the leak is from overhead is a good start as well. Wine cellars are beautiful and functional spaces to hold your wine collection. The two most important aspects of wine storage is the temperature and humidity of the cellar. Specialty wine cooling units are installed to ensure the proper temperature and humidity are maintained. When this unit failed, the homeowner was left with mold that took over his wine! 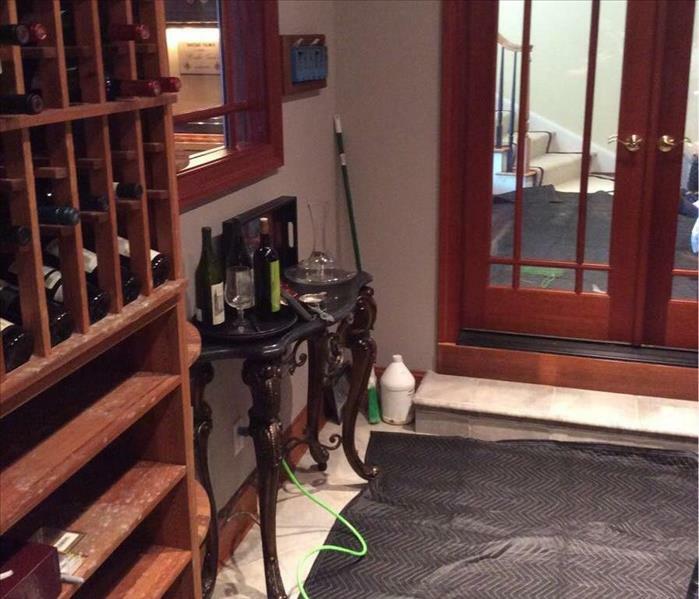 He trusted SERVPRO of Edgewater/Deale-Churchton/Lothian with the job of cleaning his prized wine cellar. 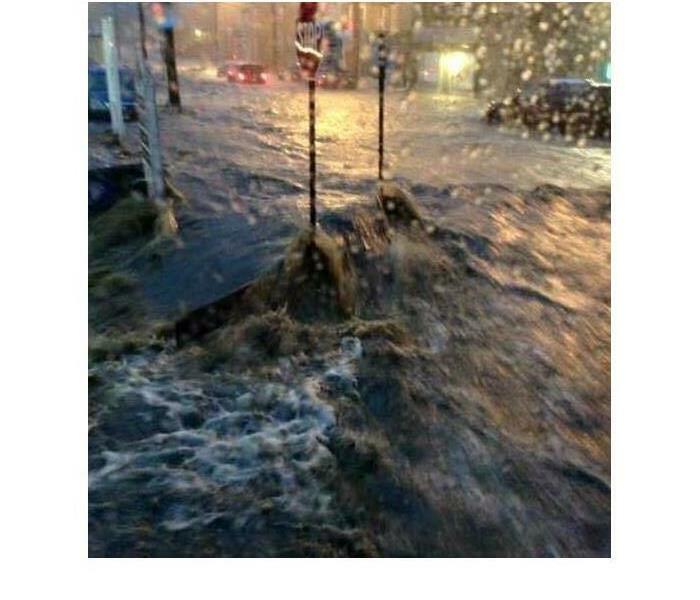 Businesses in the Edgewater area can lose money if they are not open. 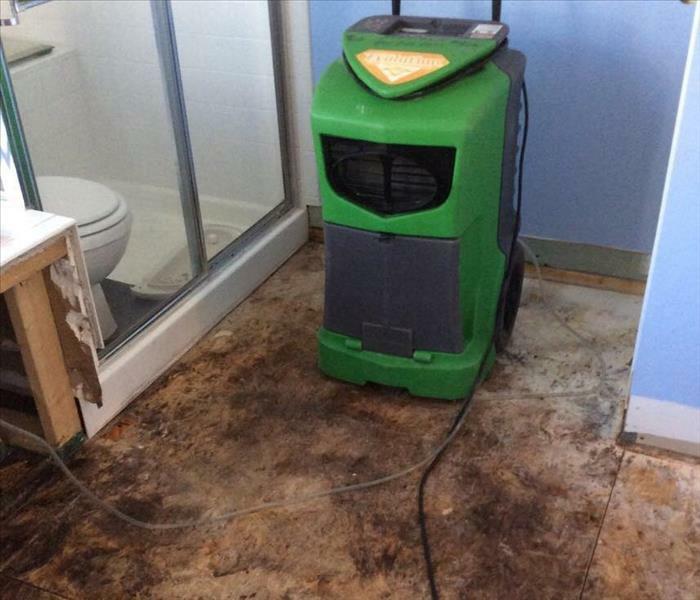 The disruption of service and work that can take place during a water damage can be significant. 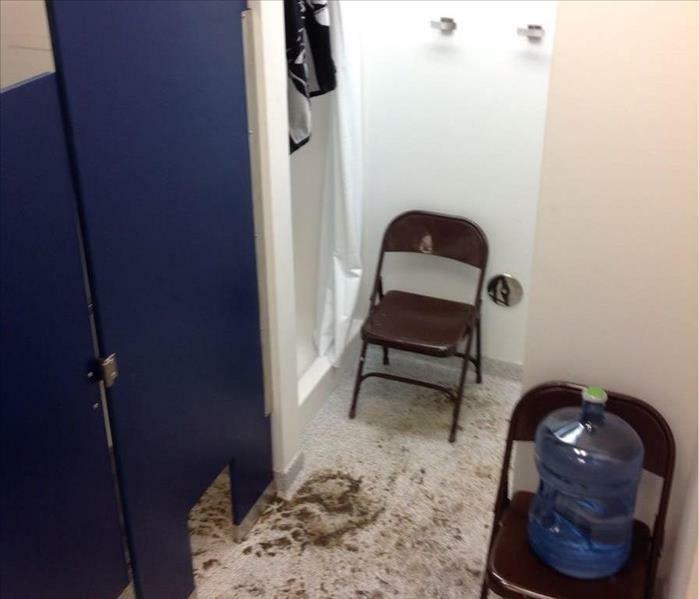 Our team rolled in on New Years Day to mitigate a water loss from toilet overflow. They set up equipment to dry the space so that there would be minimal work delays. The back of this microwave is the cause of a small home fire. The malfunctioning appliance sparked and lead to the kitchen cabinets needing to be replaced and the home needing to be deodorized. Our team was able to respond and get the home back in working order. 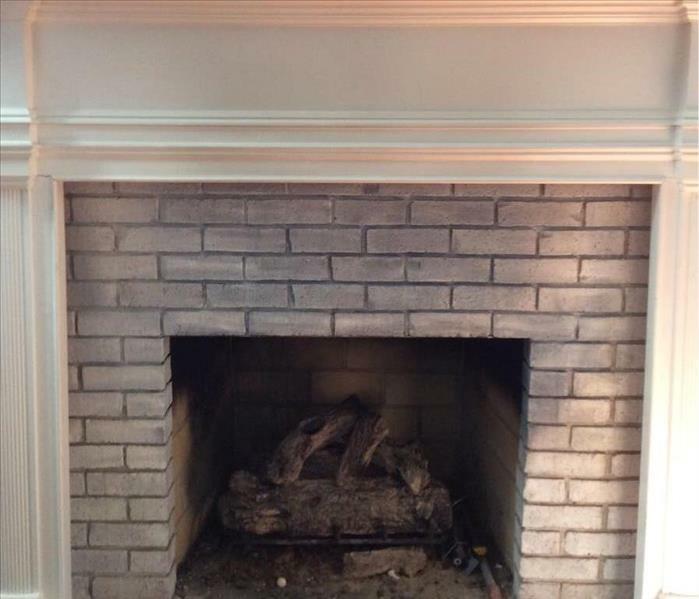 Chimney fires are very common in colder months of the year. When chimneys accumulate a build up of residue in the lining, creosote, it is very combustible. When the internal flue temperature is high enough the creosote can ignite and then lead to surrounding structure of the home. Annual chimney cleaning is recommended by the CSIA. During a fire repair job our crews are likely to set up air scrubbers. The machines are used to pull air through several filters and efficiently remove particles from the air to help improve indoor air quality. These filters are changed when they are "full" which can happen several times at a fire damaged home. Mold growth can be scary for a homeowner to tackle on their own. We recommend calling our certified professionals who will use the best protocol for your situation. Call 410-867-3590 for an estimate. Knowing is half the battle. Lots of water damages could be minimized if homeowners knew how to turn off their water. 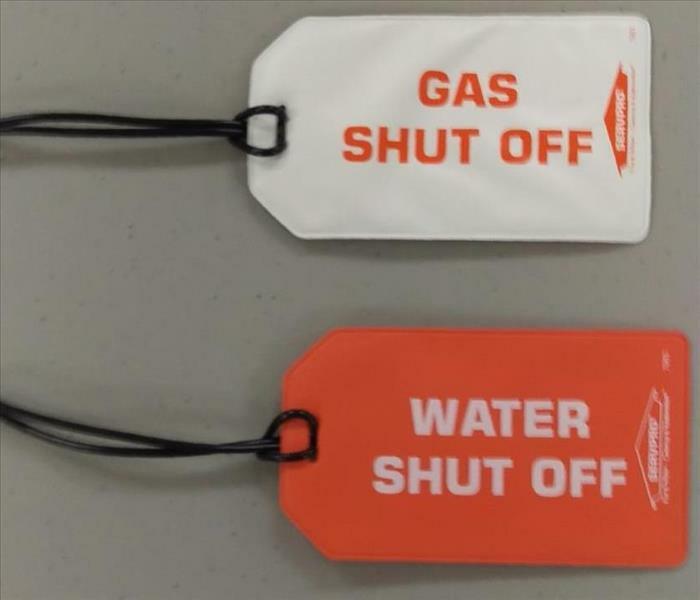 SERVPRO offers these bright tags to help remind owners where to turn off water in case of emergency. Did the baby spill milk under a seat, long time smoker quit, or an accident leave your car with a bad smell? Call our team of trained technicians who have been working with local car dealers to red cars of mystery smells for years. When storm waters flooded Ellicott City our crews where available to lend a hand, or twenty. 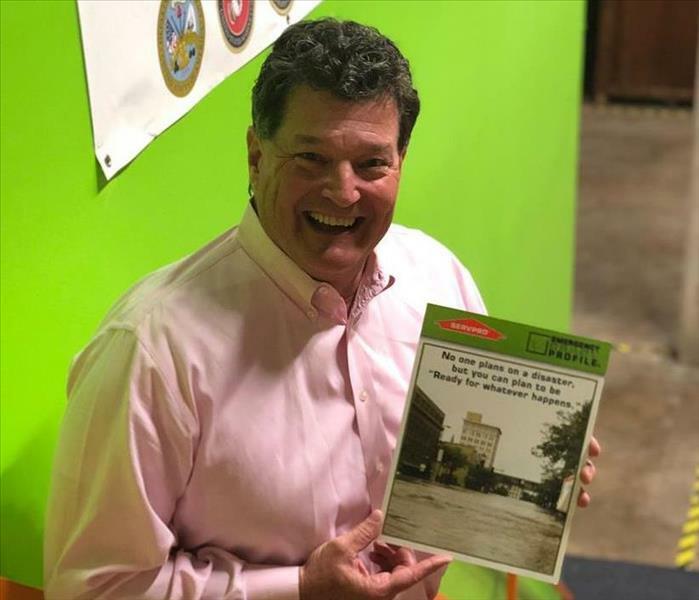 It was a a regional team effort that made restoration of the historic city possible. When a fire hits a portion of a home it can have an effect on all areas. 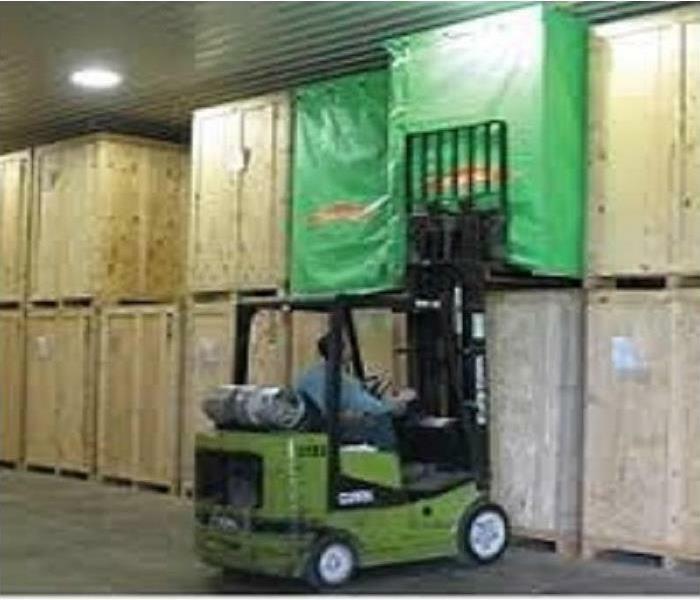 Our team can pack out the contents for cleaning and then we store them onsite, until the home is restored. Crews are working on an interior cleaning of Naval laundry facilities. 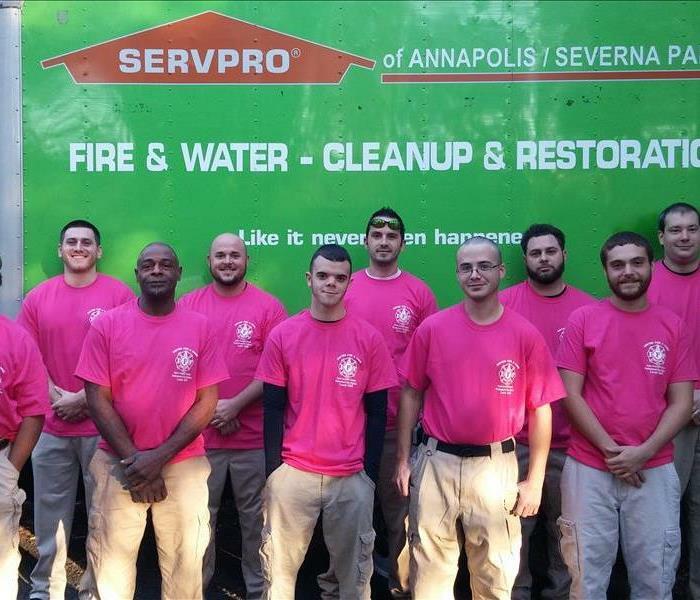 The brigade and staff are off on holiday leave so this is a perfect time to have SERVPRO crews dive in for a deep clean. Our crews hit new heights on this job. 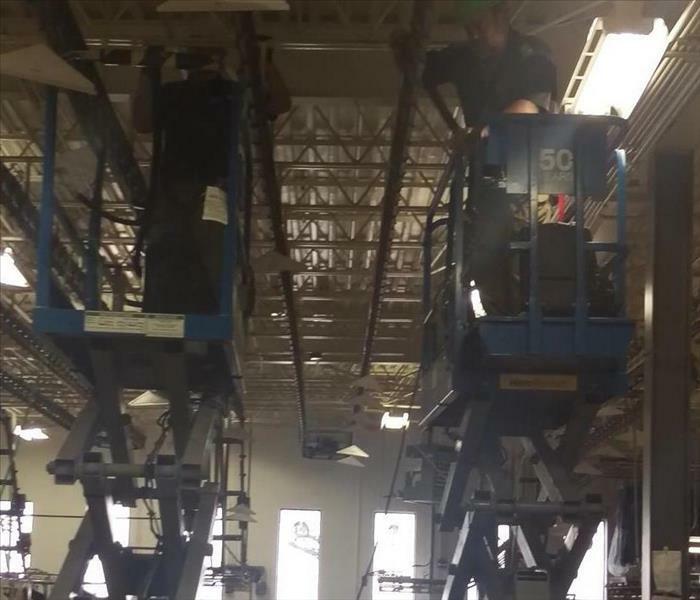 They were all required to have operator and safety class prior to heading up on the scissor lifts. 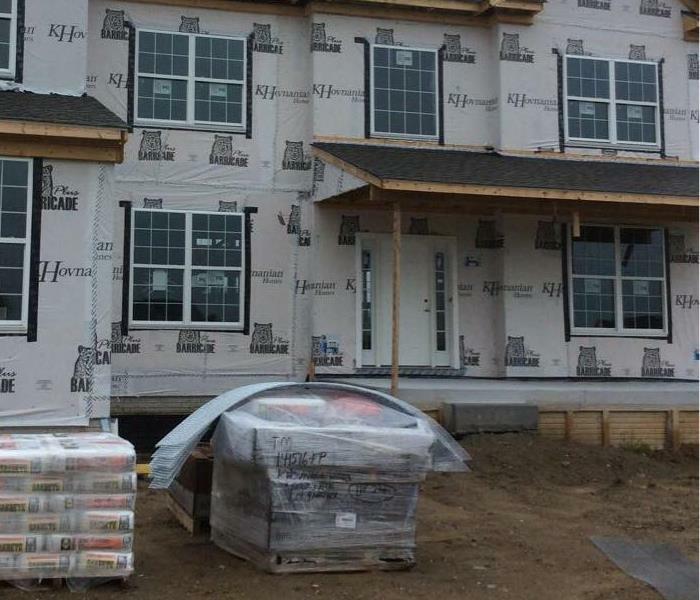 We pride ourselves on making sure our clients and employees are ssfe on job sites. 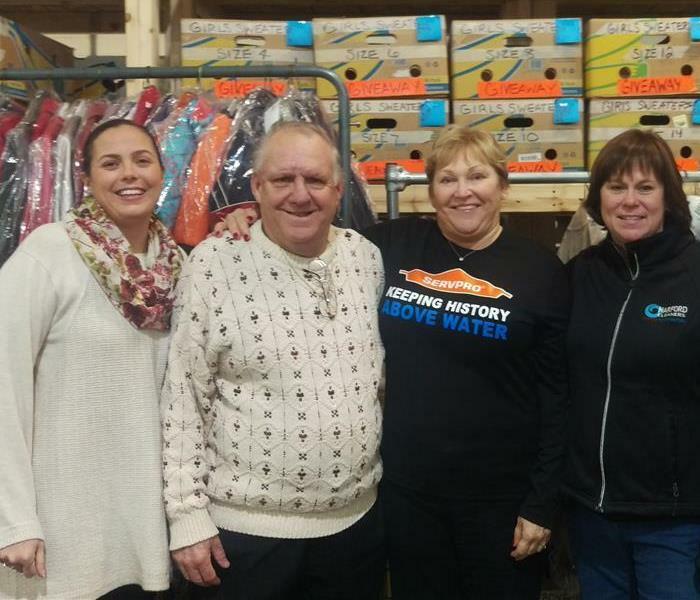 Our team along with co hosts The Green Turtle Edgewater, Southern County Chamber of Commerce and AACPS collected coats throughout December. The first batch were delivered yesterday to Leo at HOPE FOR ALL. They will be distributed to those in need before upcoming storms. SERVPRO is a proud member of BOMA. The Building Owners and Managers Association is a national organization for property and facility managers. Keeping up to speed with the people we serve is important to your franchise. Our trained technicians are certified by the IICRC, and are experts in water and fire restoration. 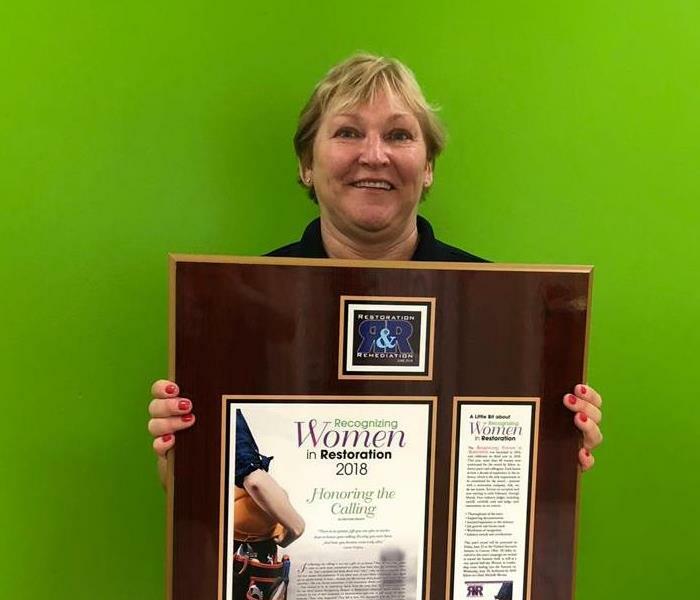 Our team is led by owner Diane Whittles, who is IICRC trained as well as ABRA Certified. The American Bio Recovery Association accredits those who are working in crime scene clean up and other hazardous situations. 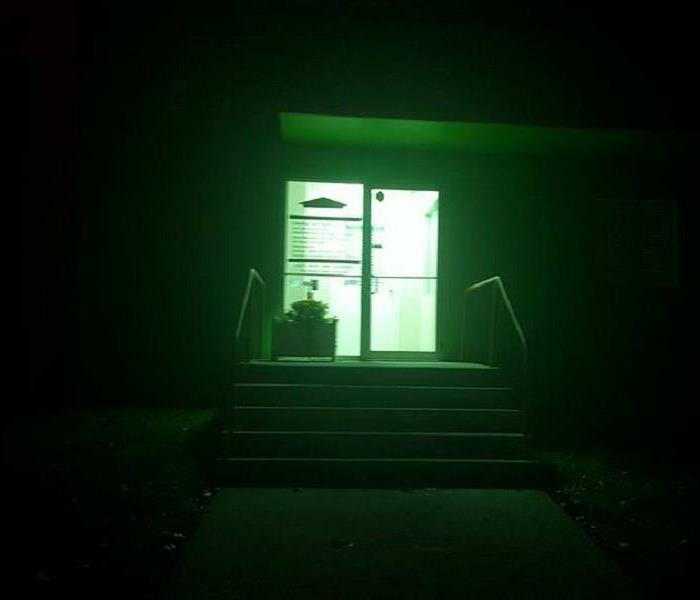 SERVPRO of Edgewater/Deale-Churchton/Lothian is proud to be participating in the Green Light a Vet Campaign. We salute the members of our armed forces as they make the transition back to civilian life. Thank you for all that you do. 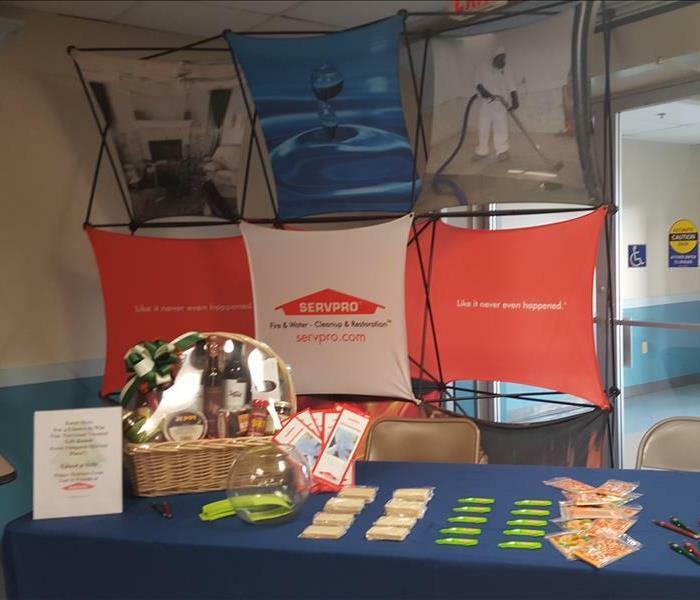 SERVPRO of Annapolis/Severna Park had a great time participating in the Holiday Trade Fair at Earleigh Heights Fire Hall in Severna Park with all the members of the Greater Severna Park Chamber. 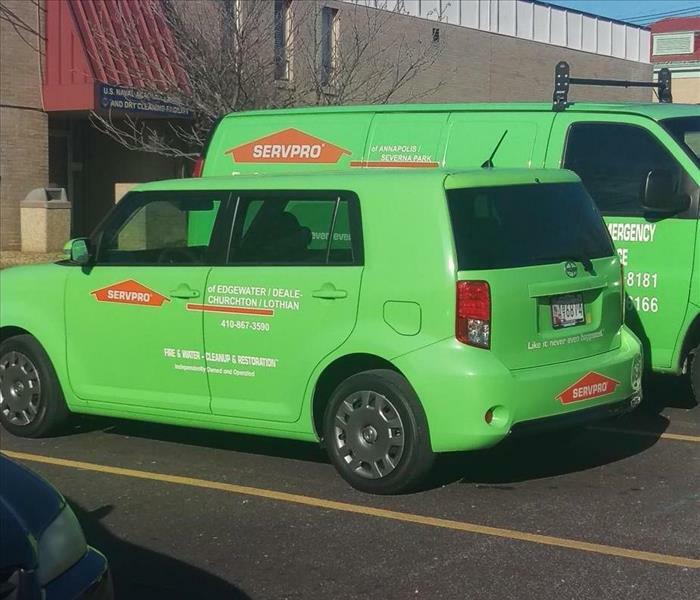 We love reaching out to the community to let them know that SERVPRO is here for them. 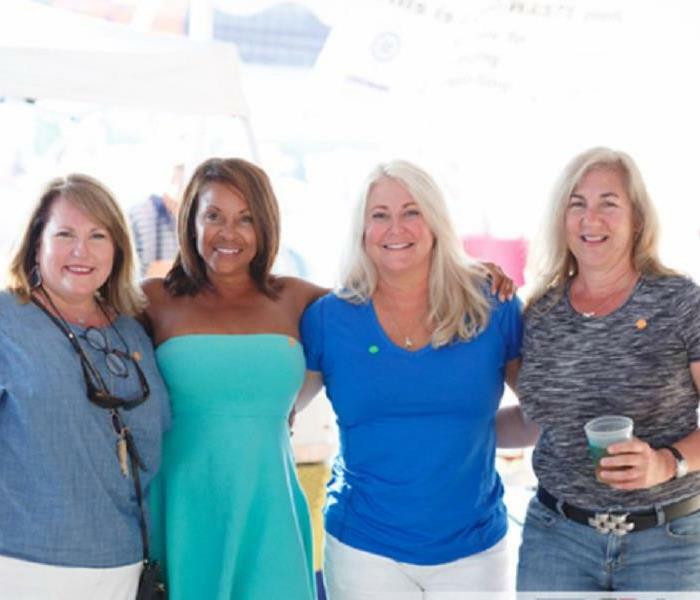 Hospice Cup XXXIV, held Saturday, September 19th, saw 87 racers and 35 dinghy poker run participants. A record breaking $40,000 was raised by raised by our fundraising sailors, with $135,000 raised overall. SERVPRO was proud to be a sponsor of this event! Our crew members wore their pink shirts every Friday in October. Our technicians are on call 24 hours a day/ 7 days a week/ 365 days a year for emergency water extractions. Whether it’s a storm, burst pipe, or even your water heater breaks they are always ready to meet your commercial or residential water removal needs. SERVPRO Christmas tree! 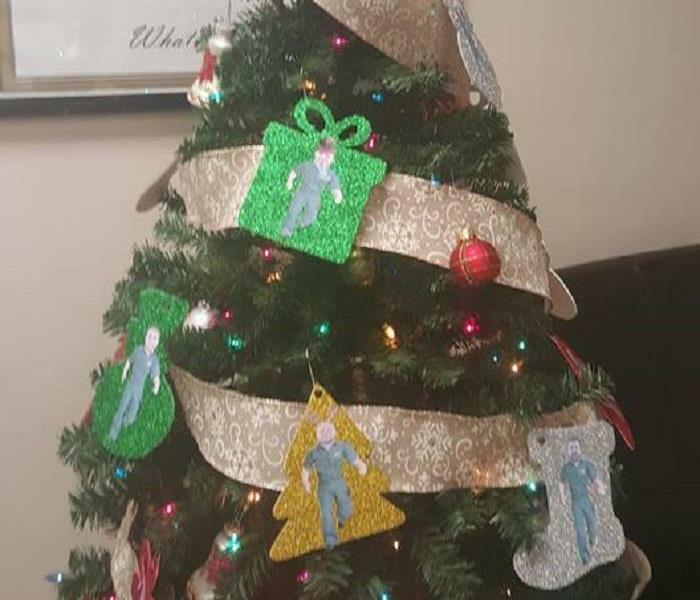 Our office staff did an amazing job making ornaments of all the staff! So grateful to be a part of this amazing team of people! 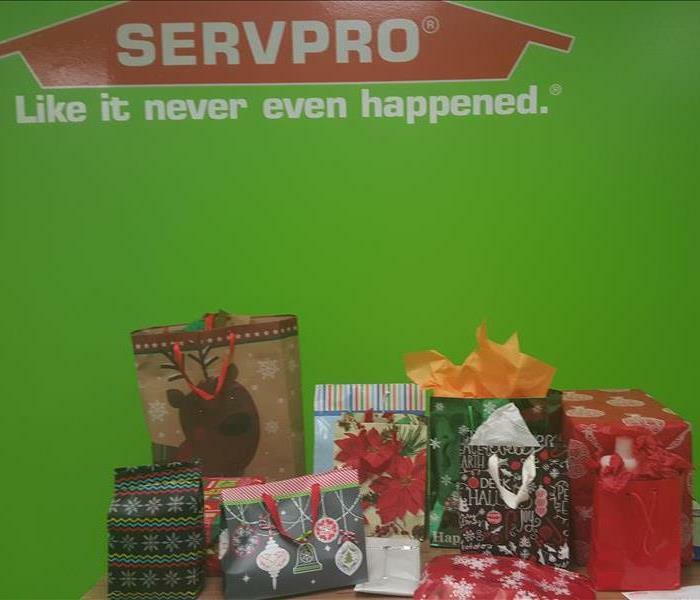 Happy Holidays from all of us at SERVPRO of Edgewater/Deale-Churchton/Lothian! 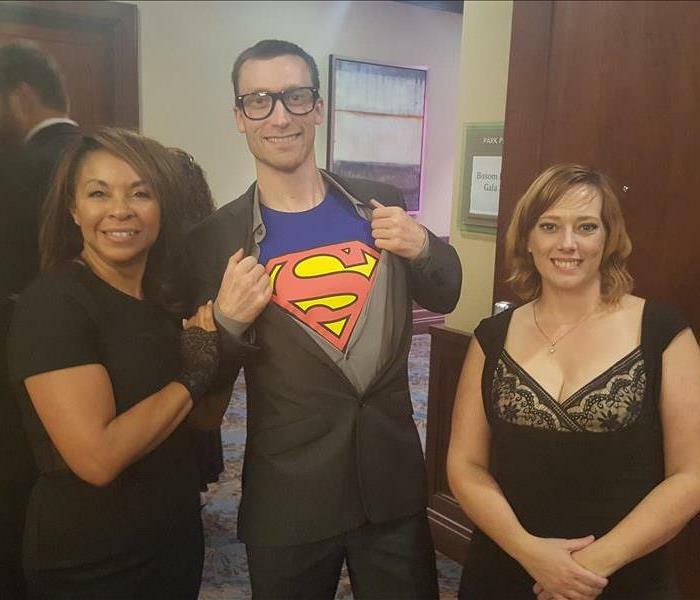 Hanging out with Superman at the Bosom Buddies Ball! Our Commercial Marketer, out on a ride along with the local Arnold 17 VFD. 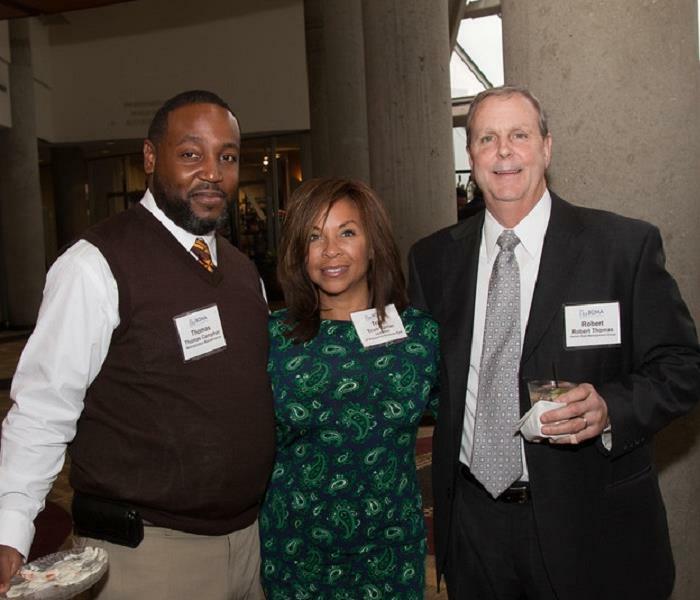 Hollis Minor, Annapolis City Director of Economic Development - Trish Turner, SERVPRO Commercial Marketer - Steve Schuh, County Executive. 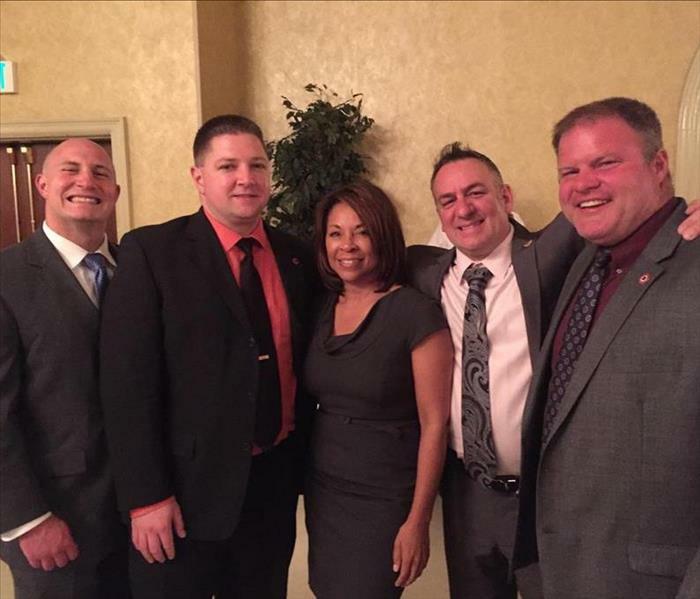 The 100 Club of Anne Arundel County provides supplemental benefits to the families of Law Enforcement Officers, Firefighters and Emergency Medical Personnel who have lost their lives in the Line of Duty in service to Anne Arundel County. 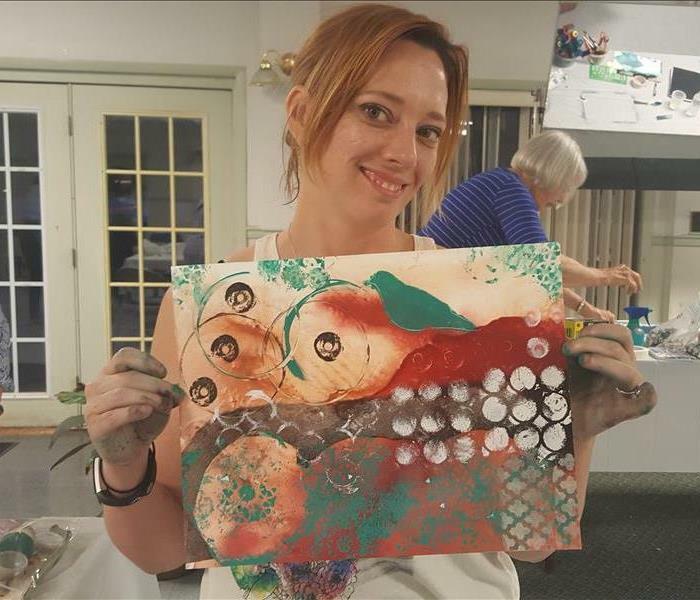 We are a corporate sponsor of the Muddy Creek Artists Guild. We support our local South Conty Artists! 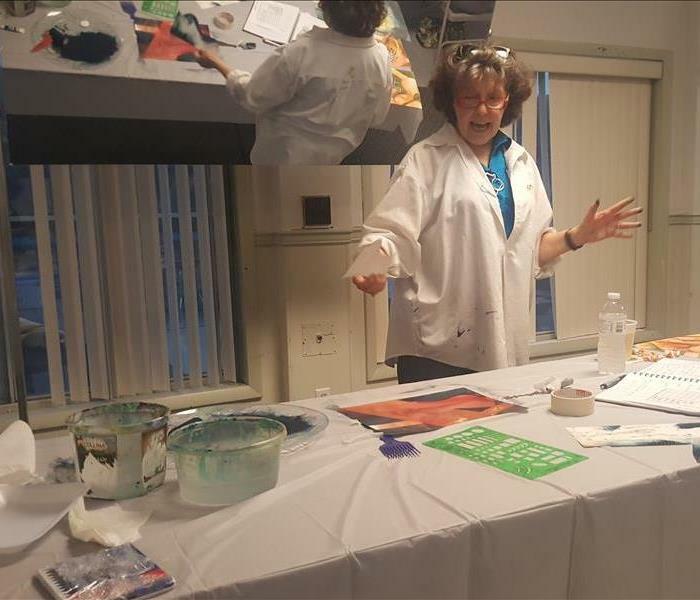 We support the arts in South County! SERVPRO Convention 2016 in Vegas!